Shintaido is a noncombative form of martial arts designed to improve physical and mental health. Although shintaido has its roots in the ancient and traditional Japanese martial arts, including elements of sword fencing, karate, and aikido. Hiroyuki Aoki, an actor, artist, and shotokai karate master, developed shintaido in Yokohama, Japan, in 1965. Enhancing physical health through a series of body movements, including warm-ups, vigorous exercises, fundamental movements, traditional movements, and exercises with a partner. Eliminating stress and amplifying natural energies of the body and mind. Developing ki, a Japanese word meaning internal spirit or vital energy. Opening the mind and fostering a cheerful attitude. Improving the ability to interact with other people. Fostering love, peace, and magnanimity. Strengthening individuality and enhancing creativity. The body movements in shintaido are influenced by traditional and contemporary aspects of Japanese culture, including dance, music, Noh theatre, and abstract art. It involves a series of movements ranging from slow and meditative to rapid and energetic. 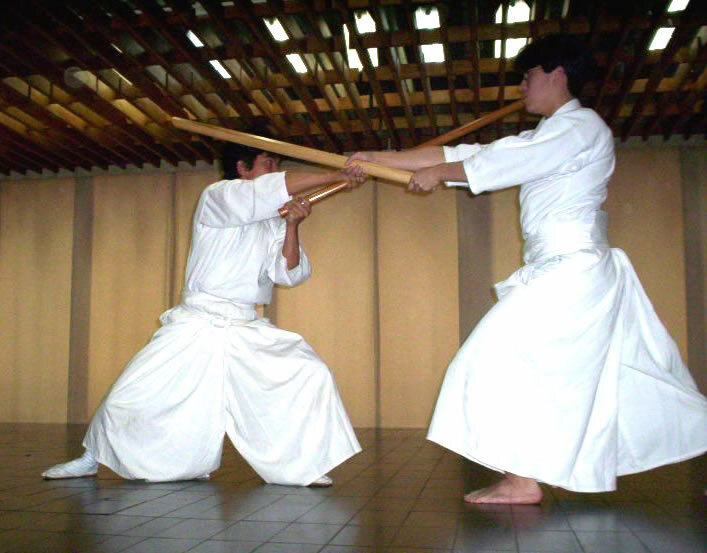 One shintaido movement, bojutsu, involves using a six-foot staff, while another, kenjutsu, uses a wooden sword. Most formal shintaido classes offered by schools sanctioned through the International Shintaido Federation or Shintaido of America are taught by an instructor and teaching assistant. The classes consist of wrap-ups, vigorous exercises, fundamental movements, partner practice, and traditional movements called kata. No preparations are required to begin shintaido. It can be practiced by anyone who desires, including children and the elderly. There are no precautions associated with learning shintaido. No serious adverse side effects have been reported from shintaido. In rare cases, beginning students of the art may experience slight muscle or joint soreness if practice is overdone. Shintaido, like other martial arts, is almost universally accepted in Japan as beneficial for physical exercise, stress reduction, and as a tool for bringing mental clarity. It is generally accepted in Western cultures, including medical science, as a legitimate and effective exercise for the mind and body. However, few if any controlled scientific studies on measurable benefits of shintaido have been conducted in the United States.